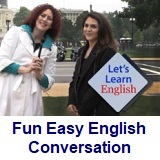 ﻿ Fun Easy English - new classroom free online classes english language lessons speaking listening writing reading january 26. 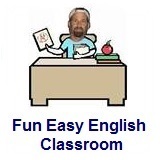 Today in the Fun Easy English classroom you are going to learn about American football. You can enjoy this game more if you understand the basic rules and vocabulary. Hi. In the classroom today you will learn a few facts about American football. American football is known in the United States and Canada as football. It is a competitive team sport known for mixing strategy with physical play. The game is played on a football field. A football field is 100 yards long from goal line to goal line and 160 feet wide. Each end of the football field contains an area called the end zone which extends 10 yards past both goal lines. At the back of each end zone are goalposts. The objective of the game is to score points by advancing the ball into the opposing team's end zone. The ball can be advanced by carrying it, a running play or by throwing it to a teammate, a passing play. At any time during a football game, there are 22 players on the field. This includes 11 offensive players, and 11 defensive players. The offensive players work together to try and advance the football into the opposing team's end zone. The offense includes a quarterback, who coordinates the players and either hands the football, or throws the football, to a teammate in order to advance the ball. The quarterback can also run with the ball. The offense also includes running backs who can either run with, or catch the football. The offense also includes wide receivers who usually catch the football. The defensive players work together to keep the offense of the other team from scoring or advancing the football into their end zone. The defense includes players in various positions on the field. The team who is on offense gets four chances, or plays, to advance the ball forward at least 10 yards. Each chance is called a down. If the offensive successfully moves the ball forward 10 yards, they get four more chances. This continues until the offense advances the ball into the opposing team's end zone or they give up possession of the football. The offense gives up possession of the football in any of the following ways. The offense is unable to advance the ball forward 10 yards in four chances. The offense is unable to advance the ball forward 10 yards in three chances and decides to punt, or kick the ball to the opposing team. The offense fumbles the football which means an offensive player running with the ball loses control of the ball and a player on the other team obtains possession of the football. The offense gets intercepted which means the opposing team catches a pass from the quarterback intended for one of the offensive players. The offense misses a field goal attempt. An offense can gain or lose yards depending on the success of each play. An offense or a defense can lose yards from a penalty, which is a punishment for violating a rule on the field. A penalty results in the loss of 5, 10, or 15 yards for the offending team. Points can be scored in a variety of ways. You can carry the ball over the opponent's goal line for a touchdown which is worth six points. You can catch a pass beyond the opponent's goal line for a touchdown which is worth six points. You can kick the ball through the goal posts at the opponent's end zone after a touchdown for an extra point which is worth one point. You can carry, or pass the ball over the opponent's goal line after a touchdown for a two point conversion which is worth two points. You can kick the ball through the goal posts at the opponent's end zone for a field goal which is worth three points. You can tackle an opposing ball carrier within his end zone for a safety which is worth two points. The winner is the team with the most points when the game time expires. A football game begins with a coin toss to determine which team will control the football. The football is then kicked to the receiving team to officially begin the game. A football game typically has four quarters with each quarter lasting 15 minutes for a total actual playing time of one hour. The football game is over if, after one hour of play, one team has outscored the other team. In the event of a tie, another 15 minute quarter is added, called overtime, to determine the winner. The first team to score any points in overtime is the winner. The top teams in the National Football League compete in the playoffs and then finally in the Super Bowl. In the Super Bowl, the top team from the American Football Conference competes against the top team from the National Football Conference. The Super Bowl is usually played at the end of January or the beginning of February. It is one of the most watched television events of the year. The television Advertisements are almost as popular as the football game. The Super Bowl is not only for people who like football. Every year people across America watch the Super Bowl because of the advertisements. American companies spend millions of dollars for only a 30 second advertisement. 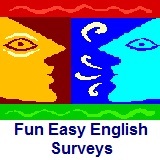 These advertisements (ads) are loaded with slang and idioms making them extremely good English practice for English language students. Below are a few favorites. Bud Light Immigrants, in the Classroom. Comedian Carlos Mencia is teaching his English students the correct way to ask someone for a Bud Light (beer) in the classroom. He then tells the students that if someone asks any of them for a Bud Light, they should say “No Speak English” so they can keep the Bud Light for themselves. Try to understand as much of the video as possible. Use a dictionary to look up words you do not understand. Bud Light Immigrants, in the Bar. Comedian Carlos Mencia takes his students out to a bar to teach them the correct way to pick up (ask out for a date) women. He says that American chicks (women) love men with foreign accents. Try to understand as much of the video as possible. Use a dictionary to look up words you do not understand. Improving Office Productivity. The C.E.O. (Chief Executive Officer) of Felcher & Sons hires a professional football player (Terry Tate) to help improve office productivity. Try to understand as much of the video as possible. Use a dictionary to look up words you do not understand. Getting The Baseball Back. Some kids are playing baseball in their backyard. The ball gets hit over the fence and into the neighbor’s yard. The problem is the neighbor never returns anything that goes into his yard. The kids send over a bag of potato chips to try and entice the neighbor into returning the baseball. The neighbor likes the potato chips so much, he returns everything he collected over the years, including M.C. Hammer, a famous singer. The kids keep everything but do not want M.C. Hammer and decide to throw him back into the neighbor’s yard. Try to understand as much of the video as possible. Use a dictionary to look up words you do not understand. A League of Their Own. A 1992 comedy-drama film that tells a fictionalized account of the real-life All-American Girls Professional Baseball League (AAGPBL). This is not a football movie but might help some of you answer the question below, Should women be allowed to play football? I began watching football when I was very young. American kids usually like a certain team and idolize certain players. My favorite team was, of course, my hometown team the Buffalo Bills. Many years ago they went to the Super Bowl four seasons in a row. Although they were not able to win the Super Bowl, it was still quite an achievement. Survey: Should women be allowed to play football? American football is a very tough and difficult game to play. Conversation Lesson 26 - This Game Is Fun! In this lesson Anna plays the game "Catch Americana" and learns more about U.S. Presidents. She also learns to watch where she walks! Anna: This is the Roosevelt Memorial. Where is the symbol? Anna remembers that Dan said: You have to find things that aren't really there. ... When you find an American symbol, you win points and a Fun Fact about a U.S. President. Anna: Yay! I found Uncle Sam and I won another 40 points! What is the Fun Fact? Voice: Franklin Roosevelt was the first to fly in a plane as president! Anna: I didn't know that. This is a really beautiful memorial. Anna: This is the Lincoln Memorial! Where is the symbol? Anna: I found it! The Statue of Liberty! Please give me my Fun Fact. Voice: Abraham Lincoln was a great wrestler! Anna: I didn't know that. Lincoln wanted freedom for all people. So, the Statue of Liberty works well. Anna: And I won 20 points! Time to find the next symbol. Anna: Sorry. Hey, it's you! Now, I should be more careful. Anna: This game is a lot of fun. Hey, what’s your name? Anna: Yeah, I guess so. Dan: Did you find any symbols? Anna: Yes, I found three and won 120 points! Dan: Me too. But, did you find the bald eagle? Anna: First one to find it wins? Dan: Anna, look out for that tree! Anna: I learned a lot about presidents with this game. But I ought to be more careful. Until next time …! Learn to pronounce the new words for this lesson. Find out more about the U.S. Presidents and the symbols in the game Anna and Dan play in the video. You can also learn another way to warn someone of danger. Use this video to learn about how people say "ought to" in fast speech. Are there any memorials to famous leaders in your town or in your country? Tell us about them. Do you admire the leader? Write about it in the Facebook Comments section below. Then practice talking about sports with a friend. Click lesson activity to get the printable PDF version. The page opens to a new window.